easier to attach the adapter plate. 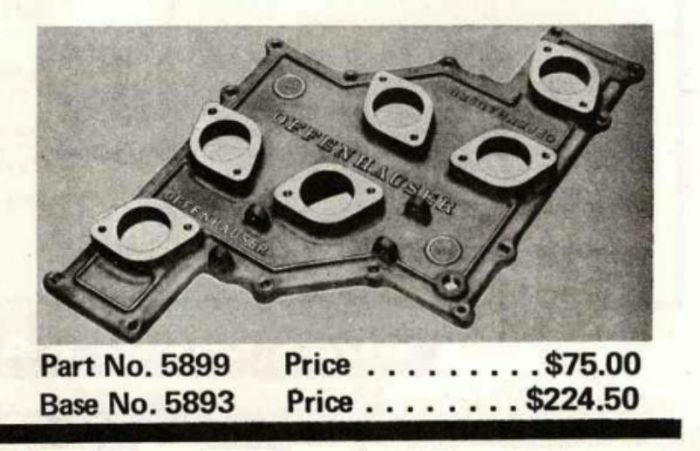 you would have to use the special "300-521 Tri-power package"
Carbs to make them fit. While very cool looking I am sure it suffered horribly from proper fuel distribution with that setup. cost of two carters on an Offy. Cut them both apart and graft it together. The plus side of doing it with this intake is you can buy carbs, linkage, and air cleaners off the shelf and if time and care is taken it will look like a factory 401 6V intake. If I wanted a 6-pack setup this is the way I would do it. Cost is no barrier if you gotta have it. And I like the idea! and welding or screwing so it does not leak air or water is the hard part. Not sure if this was mentioned but Hogan will make any manifold you want. Sure they will if you want to spend $4000 on one. FYI: None of your links are correct. When you past a URL into the hyperlink box you must delete the second http:// or it will not work.